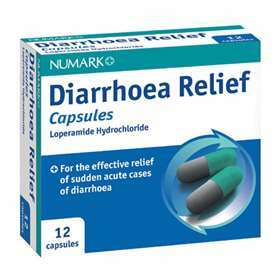 Numark Diarrhoea Relief Capsules 12 - Loperamide Hydrochloride - Can stop diarrhoea with one dose. For the effective treatment of sudden short-lived attacks of diarrhoea. Numark Anti-Diarrhoea Capsules work by making the stools more solid and less frequent. Adults, the elderly and children over 12 years of age - 2 capsules to be taken initially, followed by 1 capsule after each loose motion, up to a maximum of 8 tablets in 24hrs. LOPERAMIDE HYDROCHLORIDE, LACTOSE, MAIZE STARCH, TALC, MAGNESIUM STEARATE, GELATIN AND THE COLOURS QUINOLINE YELLOW, ERYTHROSINE, PATENT BLUE AND TITANIUM DIOXIDE. NOT RECOMMENDED FOR CHILDREN UNDER 12 YEARS OF AGE. DO NOT EXCEED STATED DOSE. CHECK WITH YOUR DOCTOR BEFORE TAKING IF YOU ARE PREGNANT OR BREAST-FEEDING. Product code: 1061910 Price: £1.20 (incl VAT) Sorry, this item is currently unavailable. Click here to receive notification when this product comes back into stock.